A physics puzzler that's stuffed full of variety. 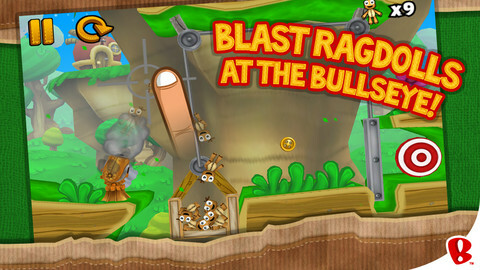 The Ragdoll Blaster series may not have garnered quite the same amount of public attention as that other physics action puzzler Angry Birds, but that hasn't stopped it from enjoying remarkable success in the App Store charts regardless. For the uninitiated, your task is to fire little ragdolls from cannons around a series of levels, gathering as many of the buttons lying around the landscapes as you can, before hitting a target that marks the end-point of each stage. Standing in your way? A vast array of cunning traps, levers, rubble and mechanisms that need to be negotiated with some very careful forward-thinking. 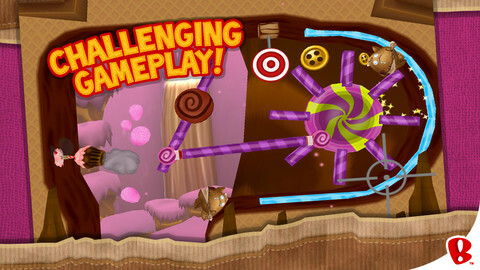 Each set of levels is themed around a particular new mechanic, so while the first set introduces you to the basics of the game, later sections will have you throwing burning ragdolls at wooden timbers to control the physics evolution of a level, or gently teasing robotic ragdolls into gravitational force-fields. None of these sections are gated either, so you'll be able to dip in and out of different themes as the mood takes you, or skip a challenge altogether if you're really struggling. No one who's even glanced at a mobile physics puzzler over the last few years will be surprised to learn that success is measured with a three-star system. As the ranking here is based on both the number of ragdolls you fling, and the number of coins you manage to gather before you hit the target, the temptation to simply spam the little blighters at a solution won't get you a great deal of prestige. As well as acting as a marker for triple-star success, those buttons are also used to buy different cosmetic upgrades such as pirate outfits for your dolls. 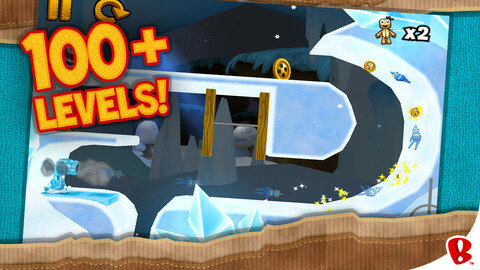 In addition to providing some fun goals to work towards, the game's store is refreshingly free of 'must-have' shortcuts to success too, and while the flip-side of this free content is that you'll have to close a pop-up ad between most levels, the truth is that it's the least invasive ad system we've seen for some time. If you're feeling generous (and you probably will after a stretch with the game), you'll have no qualms about giving the developer some cash to remove them altogether. Given its accessibility and breadth of appeal, Ragdoll Blaster 3: Deluxe is in many ways the perfect mobile game. Once you've cottoned on to the core mechanic of each set though, the difficulty does dissipate rather quickly, and you're left with no more challenge than simply executing the solution. That may be the only thing that holds the game back from greatness, but it's certainly no barrier to grabbing a game that's perfectly designed for adults and kids alike. What's Hot: A very entertaining physics game, packed full of variety, and accessible to mobile gamers of all ages and abilities. What's Not: Once you've grasped the core mechanic of each environment, the puzzle element evaporates rather quickly, leaving only the execution to be mastered.